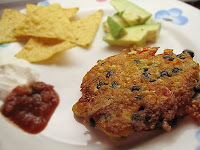 This week's bean challenge dinner was a Black Bean, Corn and Cheddar Fritter. Ours did not include cheddar, only because I forgot to add it while I was cooking (oops). You can find the recipe at Recipezaar. It tasted great and I didn't miss the cheese. Corn and beans always go good together, so I was sure I'd like this dinner. We seem to have decent luck with the kids liking our bean dinner when it looks like a "burger", or if it's pan fried. That's why I continue to try this format. Our son ate it up, our daughter needed coaxing. The first bite is always the most difficult. I cooked the black beans the night before and put the rest in the freezer this evening. I feel like I finally got the hang of cooking dried black beans. Practice makes perfect: For the first time, I did not overcook them. Cue the trumpets! By the way, last week (16) was hummus...again. I always like hummus, but it seems to taste better in the summer. Bean "comfort" food is more appealing during these cold days. Plus, beans and corn combine to create a complete protein! Do you ever cook with quinoa? Where do you do most of your grocery shopping? I like the fact that you're still eating so organically...we've been slowly cutting that out because prices for everything have gone up so much. We're always watching the $$ around here lately. I'm soooo enjoying your blog! So inspiring and the food entries are my fave....mainly because your little girl is every bit as picky as mine and I now know another Mom who serves a variety of foods and still has a picky one. I'm going to try some of those bean recipes, sister! Sue - I don't often cook with quinoa, but you have inspired me to try again! Martha - you've inspired me to write on how to buy organically on a budget and other ways to save money on your grocery bill! A post is forthcoming. Quick tips: 1)one of our biggest savings has been cutting back on meat consumption. The bean challenges have been helping too. 2) Although our brown basmati rice was not organic, we bought from bulk bins at Cub. Co-ops Whole Foods are great places to buy organically from bins. Holiday Shopping: What to Do?